Red Lodge is the easternmost ski resort in Montana, near the Wyoming border and the northeastern corner of Yellowstone National Park. 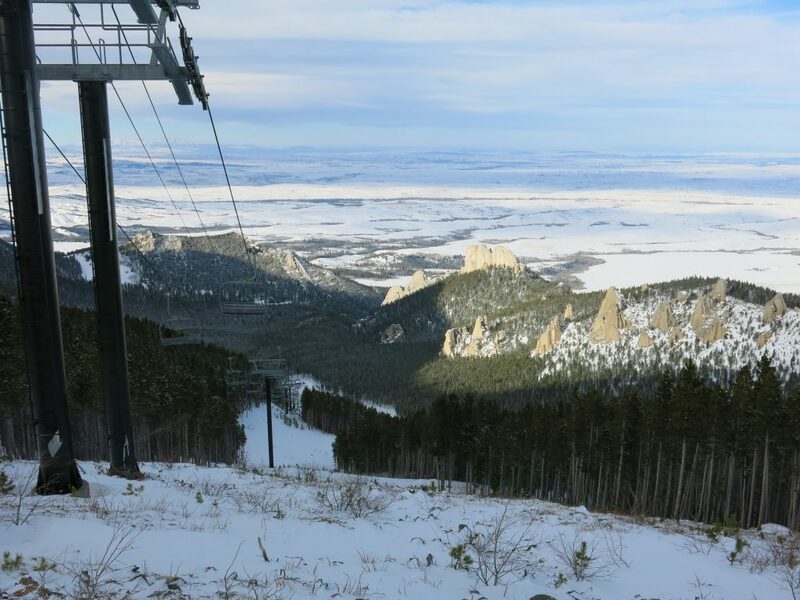 The town of Red Lodge is a popular year-round destination, and the ski area serves as the primary resort closest to Billings and places further east. Red Lodge is exactly the sort of place that we are looking for and why we go to all this trouble to take on a project like this. Far away and hard to get to, we never would have gone there without The Project. That would have been a shame because this was one of the most fun places we have skied recently. We can only give it 3 stars on a ranking, but for “fun” it was near the top of our experiences we’ve had skiing all these great resorts. 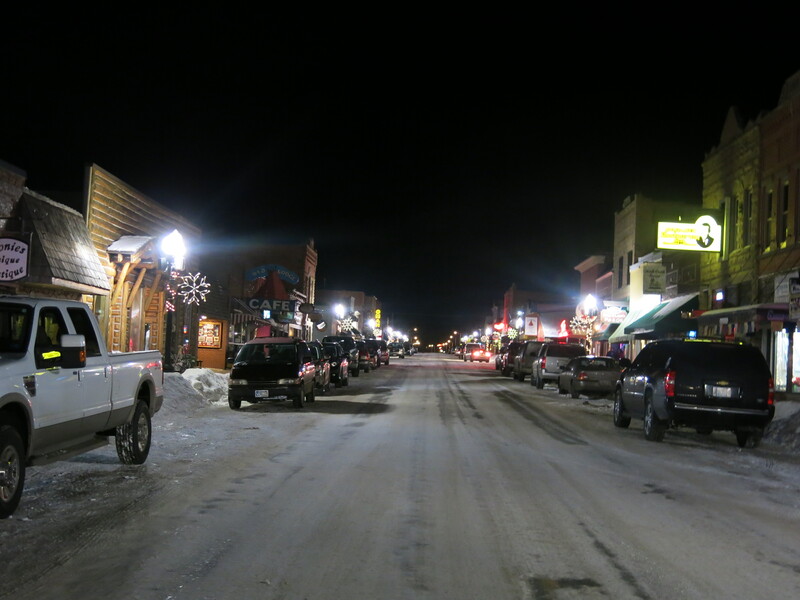 The town is an old-west style town with everything on one main street clustered around a few blocks. You stay there and walk around the town because there’s no reason to drive unless you are going skiing. 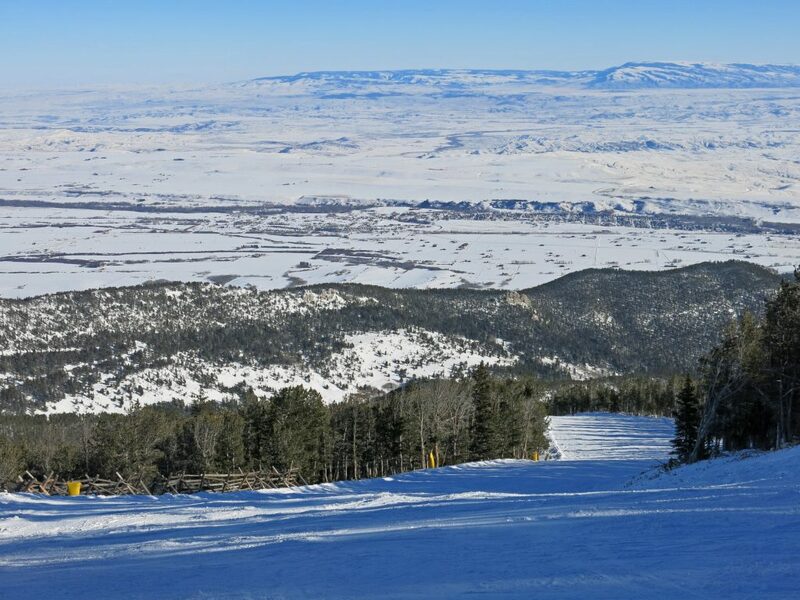 The ski area is a short and easy 6-mile drive from downtown. We stayed in the Pollard Hotel which is a historic hotel in the center of the main business area. It was fine, but not nearly as nice as the Windsor Hotel in Del Norte, Colorado we stayed at the year before. 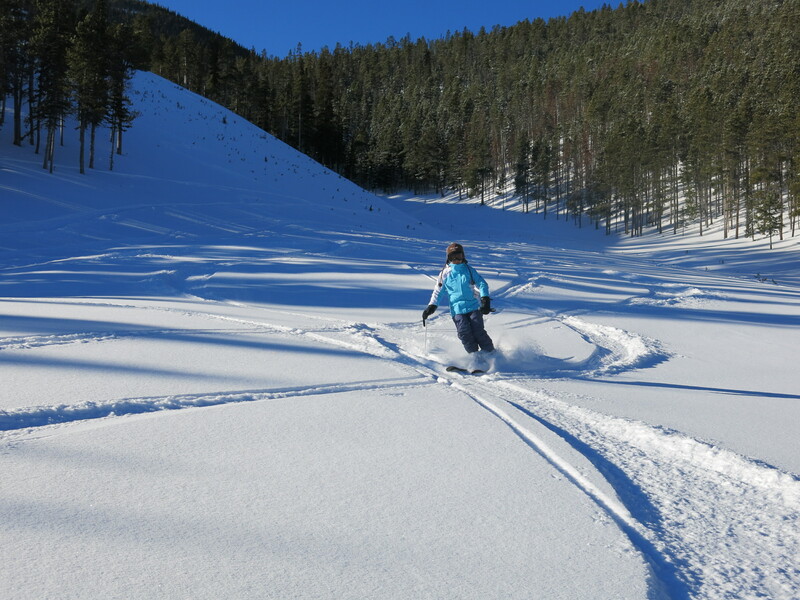 We skied Red Lodge over Christmas break, which means it was a bit early in the season and not everything was open. There are 2 high-speed quads that were not open yet, meaning that only old slow lifts were in operation. Strangely, the 2 quads serve areas that are NOT covered with snowmaking. Last year neither one opened due to lack of snowfall. Red Lodge claims 500 acres of snowmaking which is actually a lot, and they had used it well to get the main part of the mountain open. We also lucked out with a 5″ snowfall the night before. There were 5 ski pods available to us, starting with the main chair they just call the “Triple Chair”, which it is. This serves a nice variety of terrain on the lower mountain with nearly complete snowmaking coverage. Also down low is Miami Beach which is a beginner area that we just cruised by once. Taking Royal’s Run from the top of Triple, you can ski by the top of the Paradise chair, which was closed. 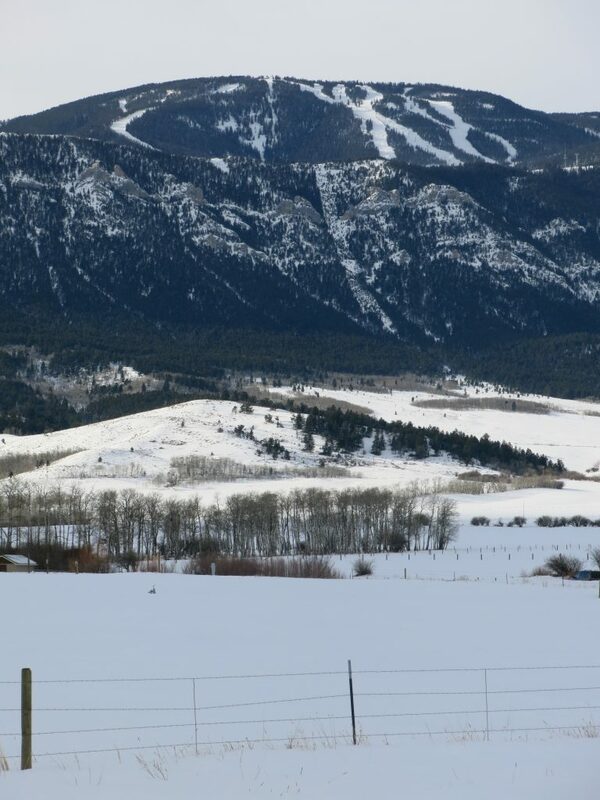 This looks like great terrain, but it’s going to need snowmaking if they ever want to consistently open it. Right now they refer to it as “Bonus Terrain” I assume because it rarely opens. It’s strange that they spent the money on a high speed quad there instead of replacing the Grizzly chair. 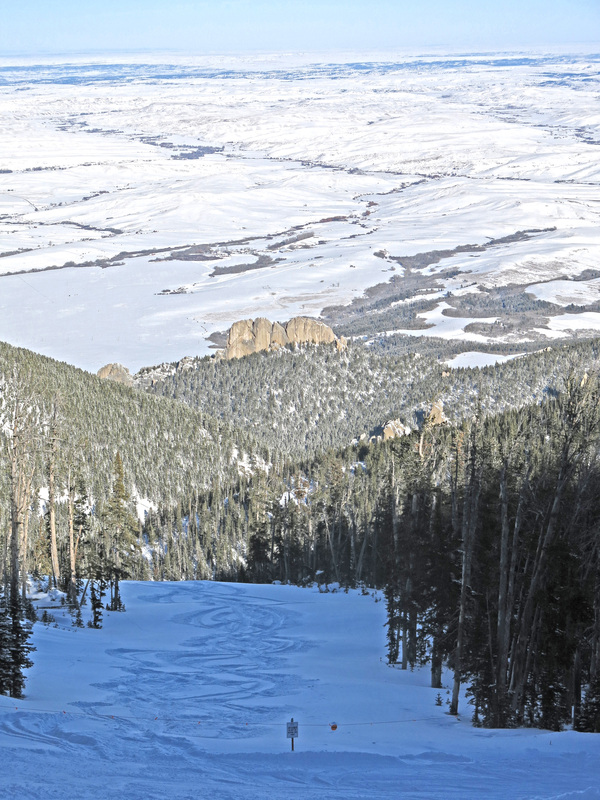 Willow Creek serves some of the same terrain covered by Triple, but without the runout at the bottom. It’s a shorter double chair but has direct access to a couple of steeper runs with snowmaking so we took that a couple of times. The main chair for us was the Grizzly Peak double. 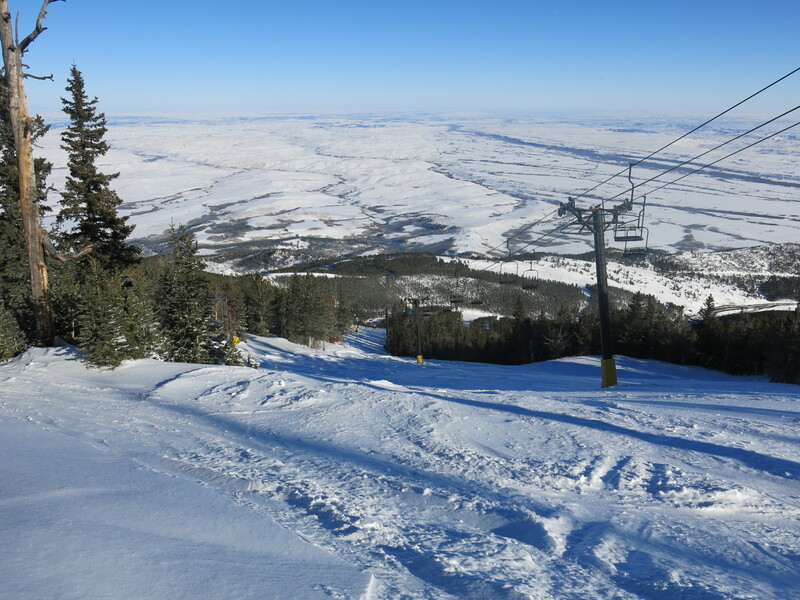 This goes to the highest point at the resort and serves the best terrain that was open. There is snowmaking all the way to the top on 4 runs, but even the ones without snowmaking were almost all open. This is remarkable given that the snowfall thus far in the season was probably less than 40″ with a 21″ base. This highlights one of the reasons we liked this place so much. 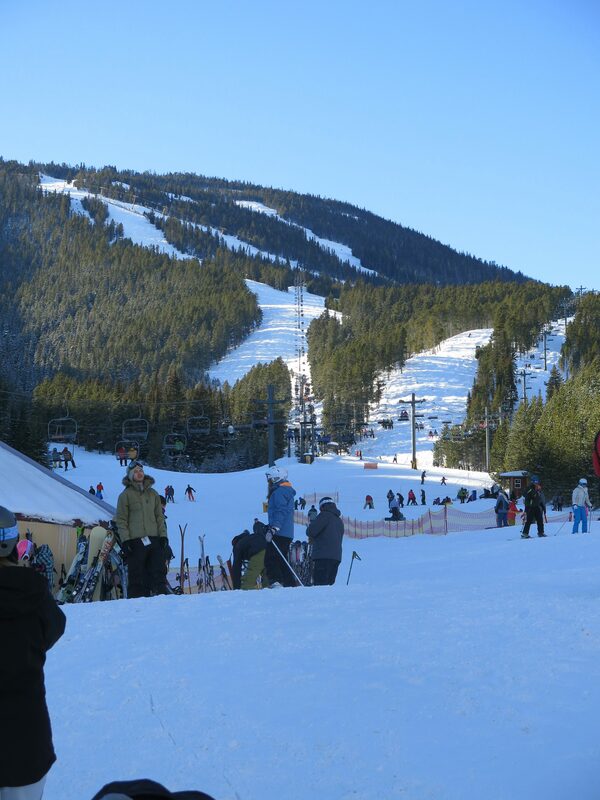 With just one double chair serving about 12 open runs, with 90% of the traffic skiing one groomed blue run, the 5″ of fresh snow kept the runs soft all day. We were skiing fresh untouched patches as late as 11AM, which would be unheard of in Tahoe. 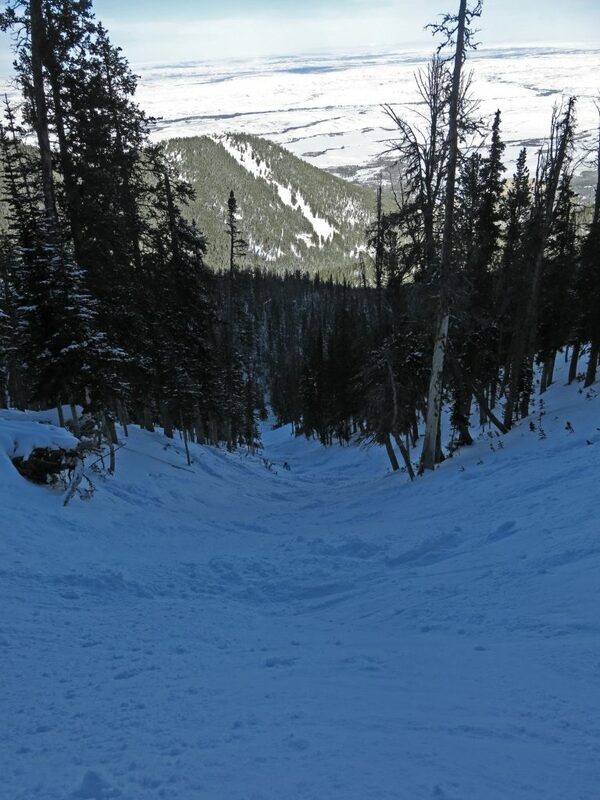 We were able to ski one of the 2 double-black runs open: Buckin Chute. This was reminiscent of some of the steep chutes at Taos, with a rocky steep entry funnelling down into a halfpipe chute. Lots of fun, and refreshingly steep. On the other side, Lazy M is a long groomed blue which was what most of the people going up there were skiing. It was completely covered with snowmaking but icy, so we preferred skiing the ungroomed. We got a taste for the Cole Creek pod by traversing all the way over to Drifter, which is one of the 2 main blue runs in that pod. More snow falls over there so it was soft even at 3PM in the afternoon. Cole Creek looks to have some seriously steep terrain with very long runs. There are 2 lodges at the bottom. One is a Cafeteria serving the usual stuff, but it’s CHEAP. A good measure of food prices at a ski resort is the price for a Hamburger, which was the lowest we’ve ever seen at $6.25. Amazing. The other is the Bierstube bar which was packed to standing room only. We didn’t go into the mid mountain lodge which was also open. These buildings are all very old and in serious need of repair and upgrading, but that’s probably not going to happen any time soon given the low prices for everything there. We paid only $52 for Holiday lift tickets, and $22 for a full lunch for 2 people. Welcome back 1985! Due special mention, we had a long conversation with the ski patrol at the top warming hut and learned a lot about the best spots to ski. We also encountered a local that introduced herself and took pictures for us and proceeded to welcome us and tell us a few things about the area. Super friendly people really made this a special experience. Yes – definitely. This place shouldn’t be missed, but wait until March when there is more snow.